Shift work has been linked to health disorders, decreases in workers’ safety and productivity, and poor family and social relationships. However, the relationship between this type of work and the incidence of psychosocial health disorders is not yet well characterized. 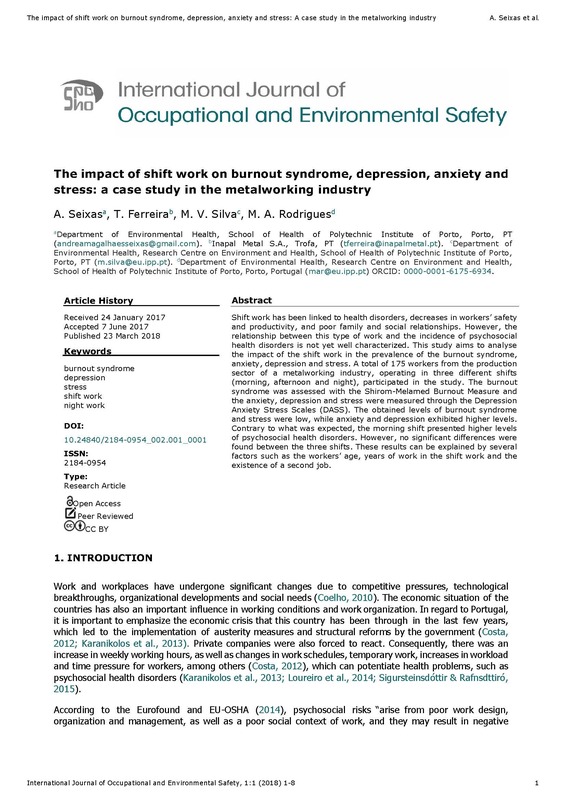 This study aims to analyse the impact of the shift work in the prevalence of the burnout syndrome, anxiety, depression and stress. A total of 175 workers from the production sector of a metalworking industry, operating in three different shifts (morning, afternoon and night), participated in the study. The burnout syndrome was assessed with the Shirom-Melamed Burnout Measure and the anxiety, depression and stress were measured through the Depression Anxiety Stress Scales (DASS). The obtained levels of burnout syndrome and stress were low, while anxiety and depression exhibited higher levels. Contrary to what was expected, the morning shift presented higher levels of psychosocial health disorders. However, no significant differences were found between the three shifts. These results can be explained by several factors such as the workers’ age, years of work in the shift work and the existence of a second job. Introduction: Assessing and developing managers’ safety competence is one method for achieving high safety performance in the organisations. Objectives: The aim of this study is to construct a safety management competence development framework to help organisations in safety promotion. Materials and methods: This study comprises a theory-based construction of the safety management competence development framework and an empirical study in a case organisation. 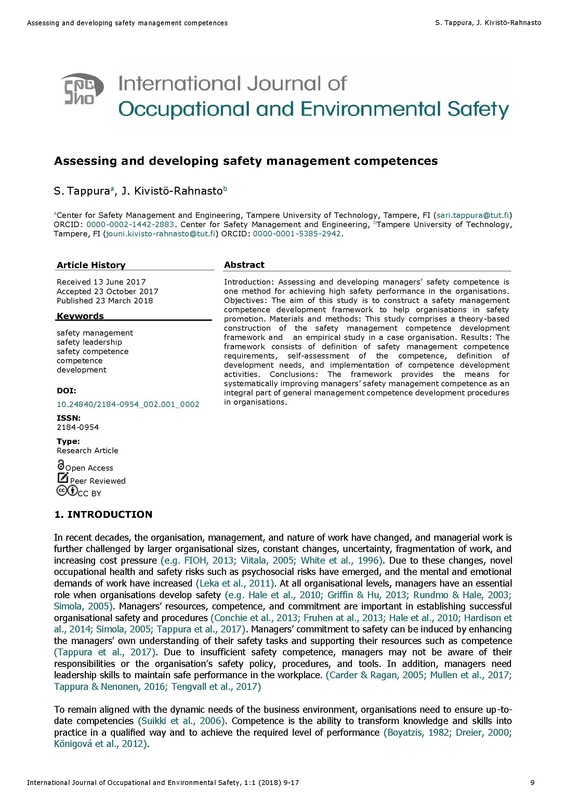 Results: The framework consists of definition of safety management competence requirements, self-assessment of the competence, definition of development needs, and implementation of competence development activities. Conclusions: The framework provides the means for systematically improving managers’ safety management competence as an integral part of general management competence development procedures in organisations. Although hearing protectors are defined as a temporary solution, they are often widely employed as the only measure against noise exposure. However, it is also known that unless workers wear the hearing protector continuously, their effectiveness will be very low. In this regard, there are some surveys that show that workers do not always wear their protectors properly and consistently while exposed to noise. 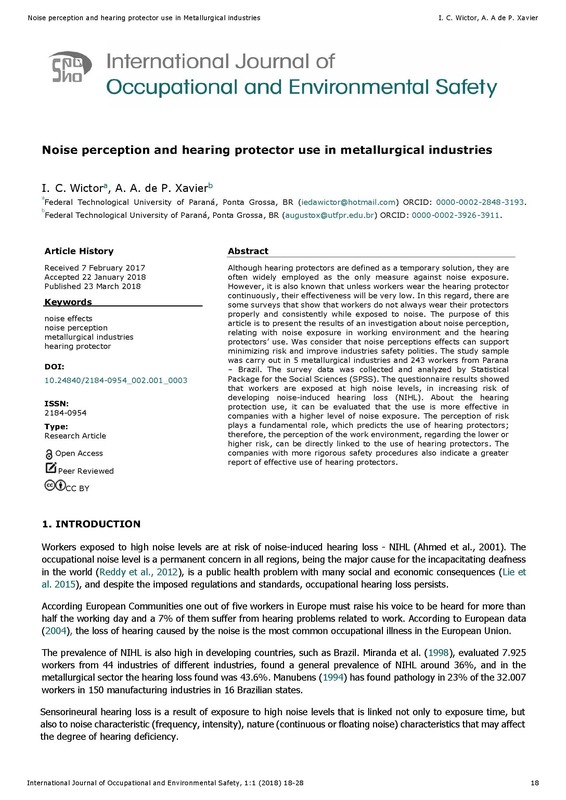 The purpose of this article is to present the results of an investigation about noise perception, relating with noise exposure in working environment and the hearing protectors’ use. Was consider that noise perceptions effects can support minimizing risk and improve industries safety polities. The study sample was carry out in 5 metallurgical industries and 243 workers from Parana – Brazil. The survey data was collected and analyzed by Statistical Package for the Social Sciences (SPSS). The questionnaire results showed that workers are exposed at high noise levels, in increasing risk of developing noise-induced hearing loss (NIHL). About the hearing protection use, it can be evaluated that the use is more effective in companies with a higher level of noise exposure. The perception of risk plays a fundamental role, which predicts the use of hearing protectors; therefore, the perception of the work environment, regarding the lower or higher risk, can be directly linked to the use of hearing protectors. The companies with more rigorous safety procedures also indicate a greater report of effective use of hearing protectors. The increase in global temperature in recent years (which is likely to continue) has the power to affect the temperatures of indoor workplaces. This increase may in turn, be reflected in human performance. 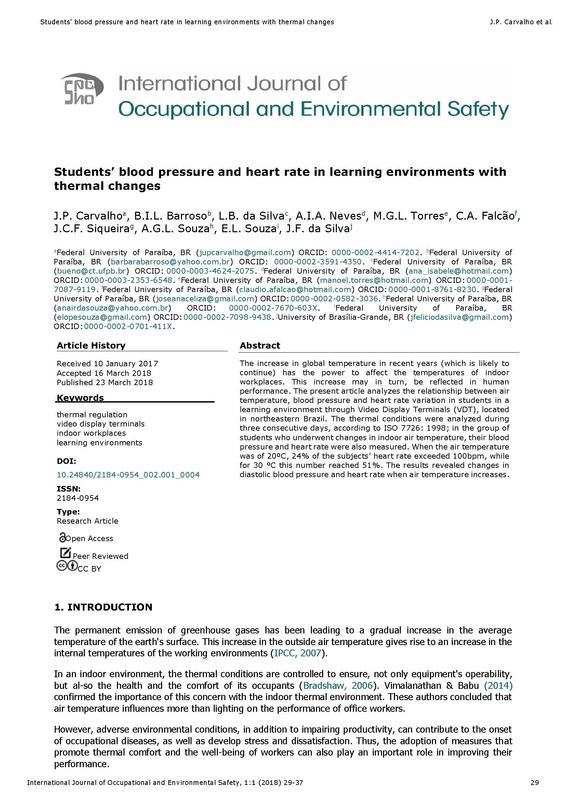 The present article analyzes the relationship between air temperature, blood pressure and heart rate variation in students in a learning environment through Video Display Terminals (VDT), located in northeastern Brazil. 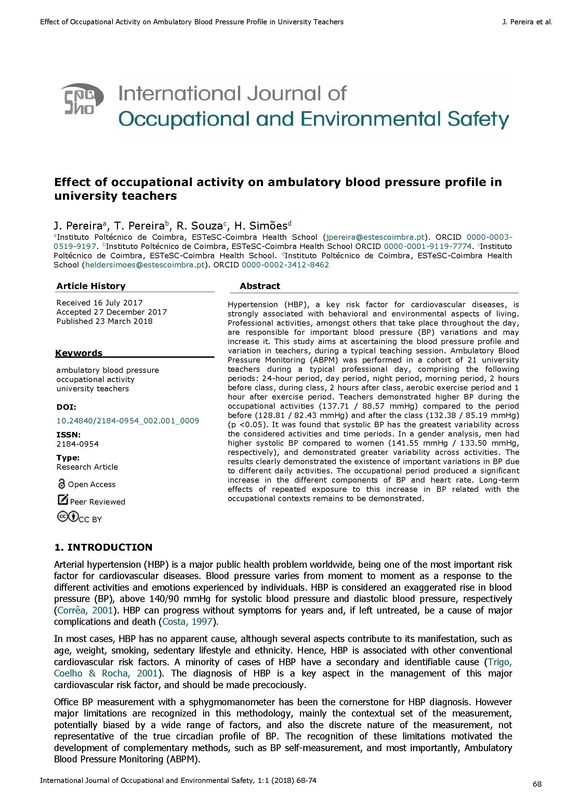 The thermal conditions were analyzed during three consecutive days, according to ISO 7726: 1998; in the group of students who underwent changes in indoor air temperature, their blood pressure and heart rate were also measured. When the air temperature was of 20ºC, 24% of the subjects’ heart rate exceeded 100bpm, while for 30 °C this number reached 51%. The results revealed changes in diastolic blood pressure and heart rate when air temperature increases. 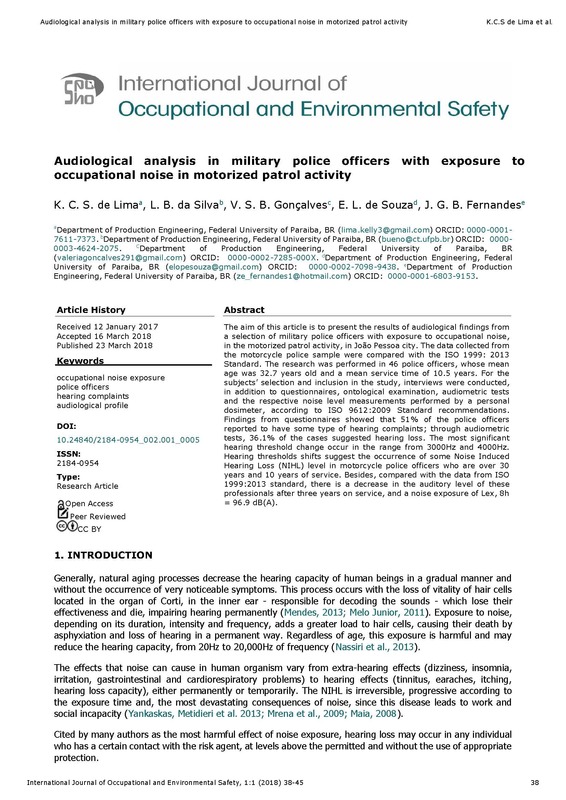 The aim of this article is to present the results of audiological findings from a selection of military police officers with exposure to occupational noise, in the motorized patrol activity, in João Pessoa city. The data collected from the motorcycle police sample were compared with the ISO 1999: 2013 Standard. The research was performed in 46 police officers, whose mean age was 32.7 years old and a mean service time of 10.5 years. For the subjects’ selection and inclusion in the study, interviews were conducted, in addition to questionnaires, ontological examination, audiometric tests and the respective noise level measurements performed by a personal dosimeter, according to ISO 9612:2009 Standard recommendations. Findings from questionnaires showed that 51% of the police officers reported to have some type of hearing complaints; through audiometric tests, 36.1% of the cases suggested hearing loss. The most significant hearing threshold change occur in the range from 3000Hz and 4000Hz. Hearing thresholds shifts suggest the occurrence of some Noise Induced Hearing Loss (NIHL) level in motorcycle police officers who are over 30 years and 10 years of service. Besides, compared with the data from ISO 1999:2013 standard, there is a decrease in the auditory level of these professionals after three years on service, and a noise exposure of Lex, 8h = 96.9 dB(A). Whole body vibration (WBV) is an emerging issue for the mining industry, occuring from the exposure due to many mining operations. 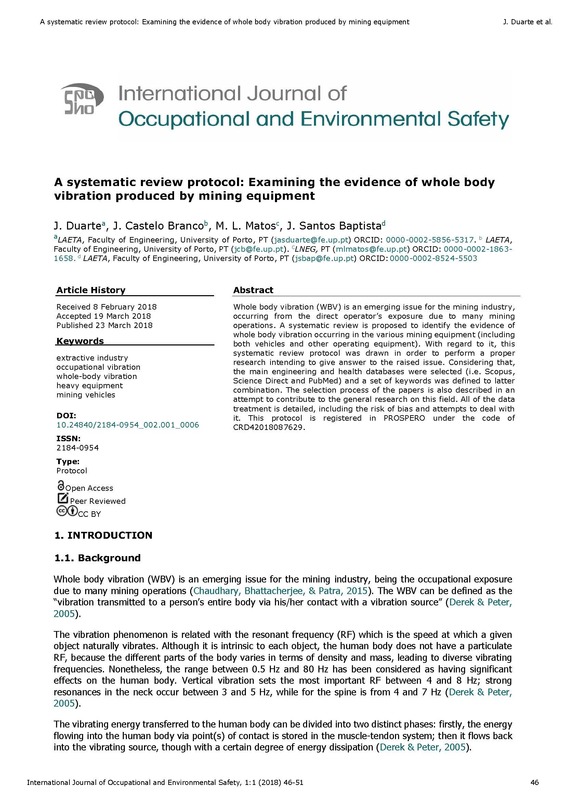 This systematic review protocol intends to give answer to the question "what mining equipment contributes the most to occupational whole body vibration and under what conditions?". For that, the main engineering and health databases were selected (i.e Scopus, Science Direct and PubMed) and a set of keywords was defined to latter combination. The selection process of the papers was also described in an attempt to contribute to the general research on this field. All of the data treatment is detailed, including the risk of bias and attempts to deal with it. The protocol for the systematic review is registered in PROSPERO under the code CRD42018087629. Background: Energy expenditure measurement based on movement quantity is showed as a relevant alternative in clinical and research contexts. The best recommended and validated methods are expensive and inconvenient to field measurement, limiting the use to the laboratory. Lately, several devices have been developed to identify and classify activities by body movements, showing acceptable outcomes. These devices and techniques have been used to estimate energy expenditure in many physical activities situations. However, for this, is necessary include physiological variables. 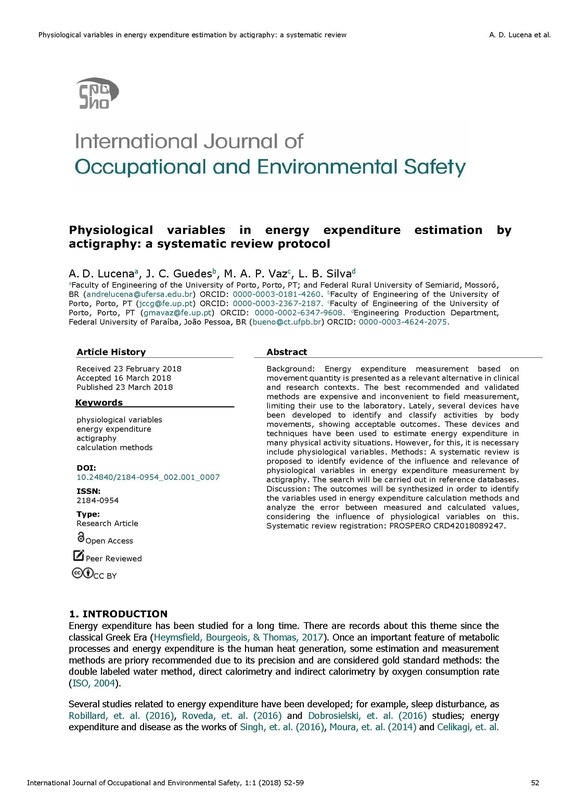 Methods: We propose a systematic review to identify evidence of influence and relevancy of physiological variables in energy expenditure measurement by actigraphy. We will search for Academic Search Complete, Scopus, Web of Science, Science Direct, Pubmed, and Informaworld by Francis & Taylor databases. Discussion: The outcomes will be synthesized to identify variables used in energy expenditure calculation methods and analyze the error between measured and calculated values considering the influence of physiological variables on this. The construction sector is notable for its interdisciplinary knowledge and complex interactions between different parties and the sector has been gradually adopting new methodologies to improve work and collaboration practices, such as the case of Building Information Modeling (BIM). 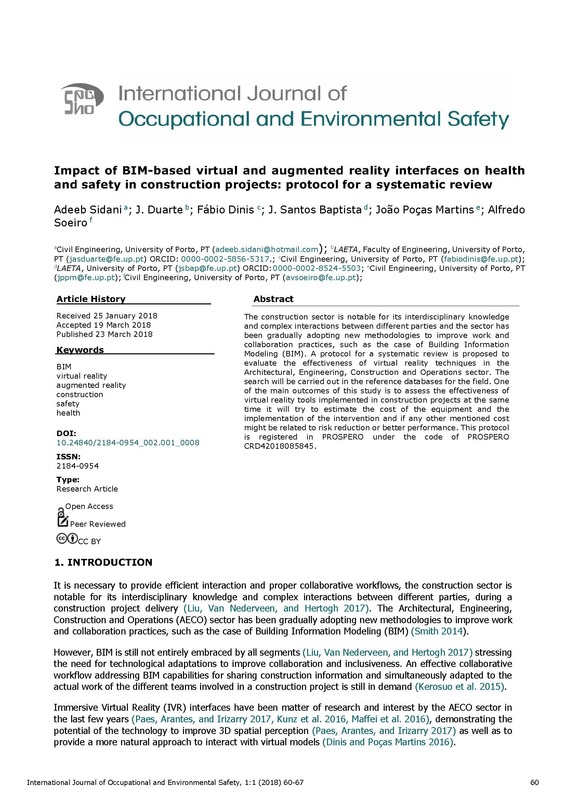 A protocol for a systematic review is proposed to evaluate the effectiveness of virtual reality techniques in the Architectural, Engineering, Construction and Operations sector. The search will be carried out in the reference databases for the field. One of the main outcomes of this study is to assess the effectiveness of virtual reality tools implemented in construction projects at the same time it will try to estimate the cost of the equipment and the implementation of the intervention and if any other mentioned cost might be related to risk reduction or better performance. This protocol is registered in PROSPERO under the code of PROSPERO CRD42018085845.